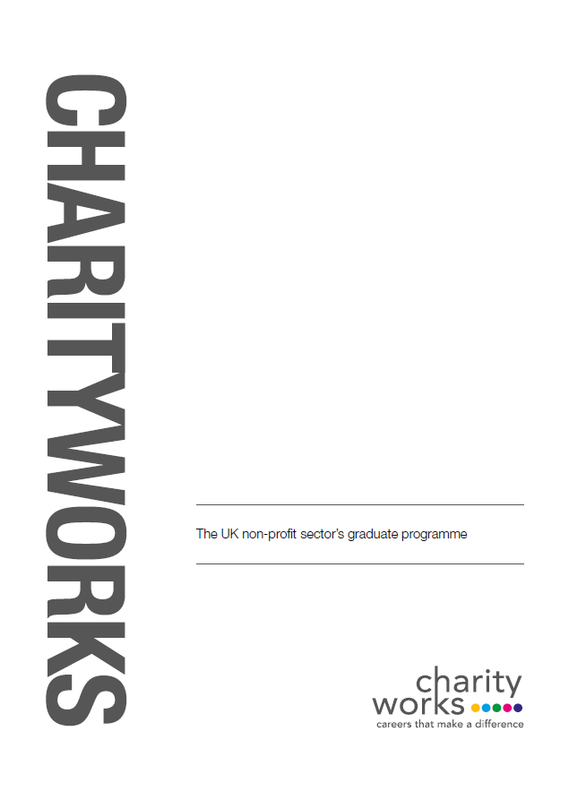 Charityworks is the UK non-profit sector’s graduate scheme. Designed to be accessible to non-profit organisations regardless of size, profile, or activity, Charityworks is a proven, affordable way to find and develop brilliant graduate talent for your organisation. A unified brand, nationwide recruitment campaign, and a first class selection process combine to give participating organisations access to a higher level of talent than they could attract individually, at a fraction of the cost of running a comparable scheme themselves. The level of talent on offer, combined with the support and development offered by the Charityworks programme, means that participating organisations should see an immediate return on their investment as well as high quality performance throughout the year. Charityworks’ aim is to support the development of a non-profit sector better able to serve the people, causes and communities that rely on it. In a challenging political and economic landscape, and in the face of increasingly complex social issues, Charityworks believe the non-profit sector’s success will depend on talented and committed people using their time and talent in the pursuit of social change. To this end, Charityworks’ provides a model which enables high potential graduates to develop their careers in the sector, at the same time as providing any non-profit organisation with a cost-effective way of recruiting and developing talented graduates. In 2018/19 will offer 140 graduate placements at organisations across the country as part of the programme. To read more about our story click here. Any non-profit employer can talk to us about hosting a trainee in their organisation. Whether you are a senior leader, looking at the programme from a HR or OD perspective, or a manager looking to fill a vacancy, the Charityworks team will support you to work out where and how you might make the most of the programme. Each year Charityworks is promoted to all UK universities via a nationwide recruitment campaign which reaches tens of thousands of students and graduates. This campaign is designed to raise the profile of the programme, the sector and our partners, and to attract talented people to apply. In 2018, we received over 4500 applications to the programme from socially minded graduates and were for the second consecutive year acknowledged by graduates as a Times Top 100 Graduate Employer. All applicants to Charityworks go through a comprehensive selection process designed to find the most capable and high potential candidates. This process, modelled on first-class graduate schemes across all sectors, includes a variety of online and in-person assessments, and is open for any client to be involved in. Following that process, the Charityworks team will work with you and the highest-scoring candidates to match the most appropriate candidate to the placements in your organisation. Starting in September each year, Charityworks Graduate Trainees spend 12 months in your organisation in a full time paid role. During this time they will focus primarily on their role for you, as well as taking part in an ILM-endorsed leadership programme, meeting a mentor, taking part in facilitated learning sessions, peer coaching and producing research to bring new ideas into your organisation. Charityworks’ role in the placement is to support and challenge the trainee, to measure their impact, and to support you and your team where appropriate through our programme team. Throughout the 12-months your organisation benefits from a talented and motivated employee capable of creating immediate impact and delivering throughout the year. As some of the most capable graduates in the UK, our trainees deliver to an extremely high standard from day one and just as importantly, are driven and committed to the cause and mission of your organisation. As well as producing excellent work, they bring fresh perspectives and enhance organisations through their network of support on the programme. At the end of the year, hosts can decide to offer their trainee(s) a job, and many do, but there is no commitment to do so. The key strengths of Charityworks lie in its affordability and its flexibility, with the model allowing organisations to bring graduate talent into their organisation wherever, and in whatever way, suits them best. If any or all of those objectives sound relevant to your organisation, Charityworks can help. If you’re interested in hearing more about joining Charityworks and hosting a trainee contact Craig at craig@charity-works.co.uk. call 0203 620 5252, fill in the ‘Express Your Interest’ form, or click here.